I’ve liked the Black Keys since at least my freshman year of college. I may have heard them before then, but I can’t be sure. I have no idea what song I heard by them first but I do know that “Set You Free”, off of Thickfreakness, is a song that goes on just about every mix CD I make. I saw them play to a packed house at Emo’s on Sixth Street in Austin during SXSW 2008. My friend had never heard them before that night and left with a new favorite band. Just a few weeks ago I ran into an old acquaintance who mentioned seeing them just recently, opening up for Pearl Jam. He also had never heard of them before the show but left with a copy of Brothers and nothing but positive words to say about them. What doesn’t shock me is that everyone I know who has heard the Black Keys loves them. What shocks me is that, back in 2008, my radio DJ buddy had never heard of them and two years later, there are still people who haven’t heard of them. How a band this good slips under the radar of so many music fans is something I simply cannot comprehend. I’ve made it pretty apparent where my feelings lay with this band but to sum it up: I dig how the Keys are combining blues with rock and garage. Every song on Brothers is great. Patrick Carney and Dan Auerbach have done it again – they keep putting out fantastic records. 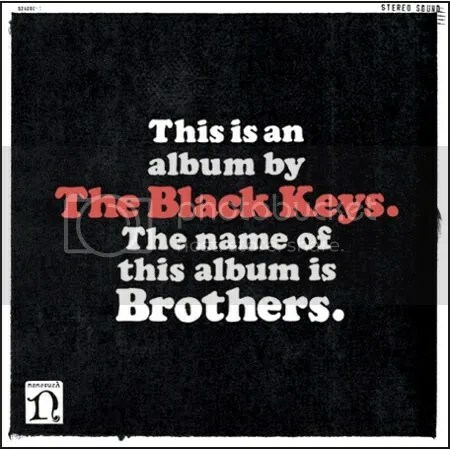 If you like the Black Keys, you ought to love this album. If you’ve never heard of the Black Keys, there’s no better time to start listening than the present. If you don’t like the Black Keys, please, slip quietly out the back door. You’re not welcome at this party. An excellent album, for sure. I’ve had it running in my car for days. This entry was posted on June 20, 2010 at 12:00 pm and filed under TheSlacker. You can follow any responses to this entry through the RSS feed.